Where Does Catappult Come From? At the beginning of 2018, we announced the Blockchain Distribution Services portal — BDS. Behind it, a very simple, yet powerful, concept: a one-stop shop for Android developers to distribute their apps and games in multiple app stores and enhance their user base and monetization with minimum effort. Furthermore, BDS also gave a chance for developers to be prioritized on search results, benefit from the best payout rate of the market for in-app purchases (at least 81%), and be able to participate in the Developers Incentive Program, where they could earn up to 125K APPC per week. We want to be a viable, easy and fair alternative for apps distribution, where all — and not only a few — can win. This was only possible thanks to AppCoins — an open protocol based on blockchain technology, that was designed to address the fundamental problems harming developers and the mobile apps ecosystem: excessive concentration of the distribution in a single entity; lack of transparency and fraud in apps advertising; and lack of trust in third-party app stores for distribution and monetisation. The AppCoins Protocol came to revolutionize the apps ecosystem by unlocking the world of in-app purchases to billions of users and, at the same time, benefiting developers by providing them with significant revenue and transparent ways to reach their users. With the premise of improving app discovery and making financial transactions — like advertising and in-app purchases — more effective, AppCoins seeks to find a better way of servicing both users and developers. We want to unite app stores and developers. Small and big players. Dreamers and doers. And help them reach millions of users globally. Back then we decided to center all our efforts and communication in the blockchain technology. Why? Because this type of technology would help us solve the key constraints that the app economy faced when it came to advertising, app monetization and apps approval. It would allow us to create and provide developers and users with a more flexible and trusted environment. Although this was something new, and difficult to grasp for most people, it had tremendous potential, and we wanted to make this new open standard for apps distribution available and beneficial to all parties involved — especially developers. In order to succeed we need to be in the developer’s shoes, understand their pains, their concerns, and ambitions. The truth is that the current market disregards the developers’ creation, artistic vision, and merits completely. We, on the other hand, believe that developers should spend their time developing the best games and apps and not having to worry about other issues, such as integrating SDKs. As such, Catappult was built to give the power back to the creators, allowing them to reach new heights, thanks to Blockchain technology and an open ecosystem. Our main purpose is to help developers reach millions of users without having to worry about unnecessary complexities. In only a few months, the BDS portal and the AppCoins Protocol started to become the industry standard for apps distribution. Up to December, we had more than 5000 developers engaging with the platform and millions of downloads from users across the globe. In a year we learned a lot. We understood that the challenge goes far beyond the blockchain technology and that in order to succeed we need to be in the developer’s shoes, understand their pains, their concerns, and ambitions. We want to be a viable, easy and fair alternative for apps distribution, where all — and not only a few — can win. That’s why Catappult offers developers the best payout rate in the market: instead of just 70% or even less, we give developers at least 81% of the IAP revenue, and up to 96% if they choose to distribute the app directly on their website. We want to be a fair and a trust-worthy platform where developers are guaranteed to have the best service possible. Catappult offers developers the best payout rate in the market: it gives developers 81% of the IAP revenue, and up to 96% if they choose to distribute the app directly on their website. Catappult will be a new safe and secure quality platform that offers a better set of functionalities to developers. We want to unite app stores and developers. Small and big players. Dreamers and doers. And help them reach millions of users from all over the world. 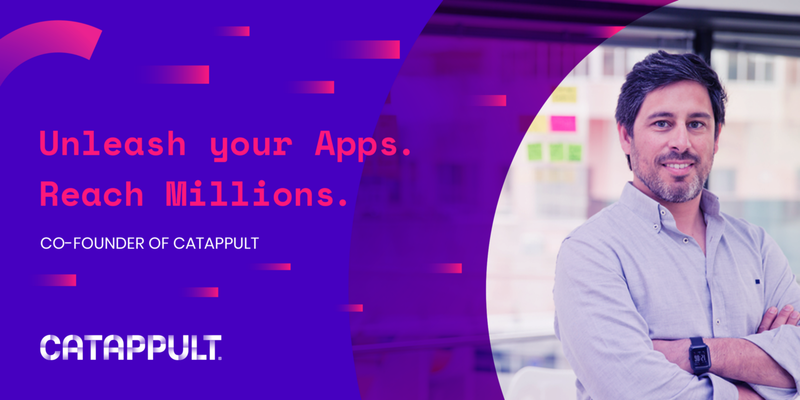 Welcome to Catappult, the platform where you can unleash your apps and reach millions of users. The World’s First Blockchain App Distribution Solution. Unleash Your Apps. Reach Millions.